As for our shop, STEMS floral design offers a welcoming home to all. Our rustic down to earth nature is much enjoyed by locals and visitors from afar. STEMS is always designing new, one of a kind floral creations. In addition to our floral services we also carry jewelry handcrafted by local artists, hats handmade in Hawaii and bath and body scrubs by Soulscents. We also provide local surf art and paintings from the hidden talents of the hill! 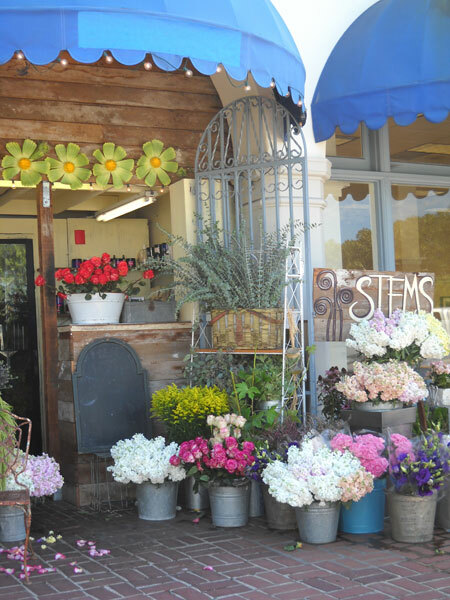 STEMS floral design proudly serves all of the Southbay, including the surrounding beach communities. Some of our favorite local venues include La Venta Inn, Palos Verdes Beach and Athletic Club, Neighborhood Church, Trump Golf Course, Wayfarers Chapel, Palos Verdes Country Club, Redondo Beach Historic Library, Verandas and The Adamson House. But if you have needs far away, STEMS is always willing to travel – San Diego, San Francisco, Philadelphia and Hawaii have been some of our destination, to name a few. Kate started designing in the Malaga Cove Plaza at the age of fifteen, and after seventeen years of developing her passion for flowers she was fortunate enough to purchase the very shop where her love of floral design began. She is inspired by her surroundings and tailors each special event accordingly. Her love for color, texture, nature and design is always growing and evolving. From traditional to modern, her attention to detail shines. Kate especially enjoys working closely with her clients and turning there visions into a reality. STEMS floral design looks forward to creating your special day. We specialize in weddings, birthday parties, bar mitzvahs, bridal showers or just flowers for your home. We will bring the beauty to you! Come by and see us.